I am always learning new things in my job. A few years ago I had a problem with carpenter ants that originated in some firewood. I knew that I needed professional help and I contacted a reputable pest control company, thats where I met Juan with Willard Pest Control. I really learned a lot that day, and I have had a great working relationship with Willard's ever since. Fast forward a year later, and Juan was looking at a home to buy himself, and he hired us to inspect it. He did what almost no other clients do, he went into the crawlspace with me. While I was looking for structural pests, Juan taught me some great tips for detecting other types of pest problems. 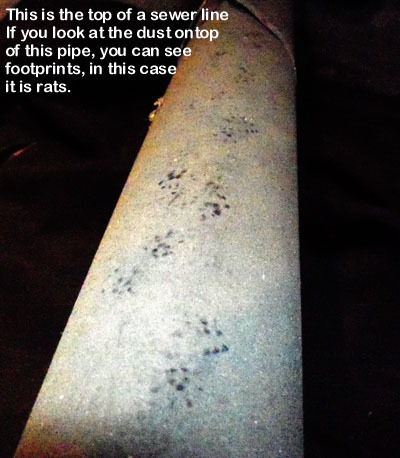 In a crawlspace that is dusty, and most of them are, you can see evidence like this when there is a rat infestation. Here is another example. 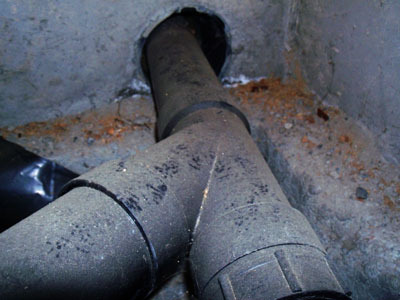 This is where a sewer pipe passes through the foundation. The rodents have been coming in around this sewer pipe as the hole through the concrete is a lot bigger then the pipe itself. In this case, there was not a lot of droppings or any other evidence, but the footprints left behind are clear evidence that they have been there. We are not experts at rodents or their control, but know people that are and we see evidence like this every day. If you have issues with any kind of pests, give us a call. We will give you advice and recommend tips to get them under control. Read more about rodents and control from WSU extension service.